Hollywood’s summer box office flopped. Revenues are down nearly 16 percent--a precipitous drop from last year. 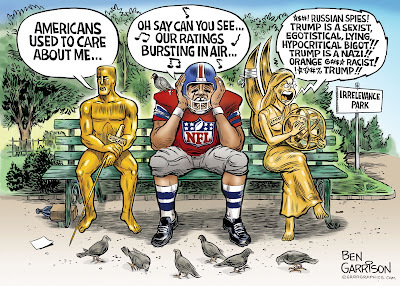 The NFL ratings are also crashing. "Thursday Night Football" is down 13 percent from last year and fewer fans are attending games. The Emmys ratings have also cratered. What’s causing these declines? It could be that leftist politics are being injected into American entertainment. Hollywood continues to spew out the same politically correct kitsch. Their movies have become too formulaic and repetitive. There are too many comic book movies chalk full of computer graphics showing crass, physics-defying violence. And of course, political correctness is always the number one priority. Then we’re expected to endure condescending lectures about climate change and social justice from the overpaid actors who show up at the Oscars. The NFL’s decline is due to too much political correctness as well as the feminization of men. We are supposed to fret about overpaid athletes getting concussions, which can later lead to permanent brain damage. This used to be part of the game. It has always been violent. Like boxing, such violence is part of the attraction. Don’t want to be punch drunk? Don’t box or play football. It’s their choice and they know the risks. It’s difficult for a lot of ticket buyers to feel sympathy for players who command multi-million dollar contracts and then worry about getting injured. More rules and penalties made the game safer while also rendering it duller. Some say the game is being feminized. Players wear pink for ‘breast cancer awareness month.’ Pink everywhere. Then came the national anthem protests. Many players can’t even articulate why they are insulting our country. Maybe something somewhere past present or future is not equal. To them, America is not perfect and must be disrespected until it is. Why can’t they protest on their own time? Last week, a Seattle anthem sitter also gave the black power fist salute after making a tackle. It’s now on the field. Sure, it’s his free speech, but it’s our free speech to speak out against it and stop supporting the NFL. If they can dole out fines for those giving the finger to the crowd or making lewd dances after a score, they can certainly hand out stiff fines to the sitters. 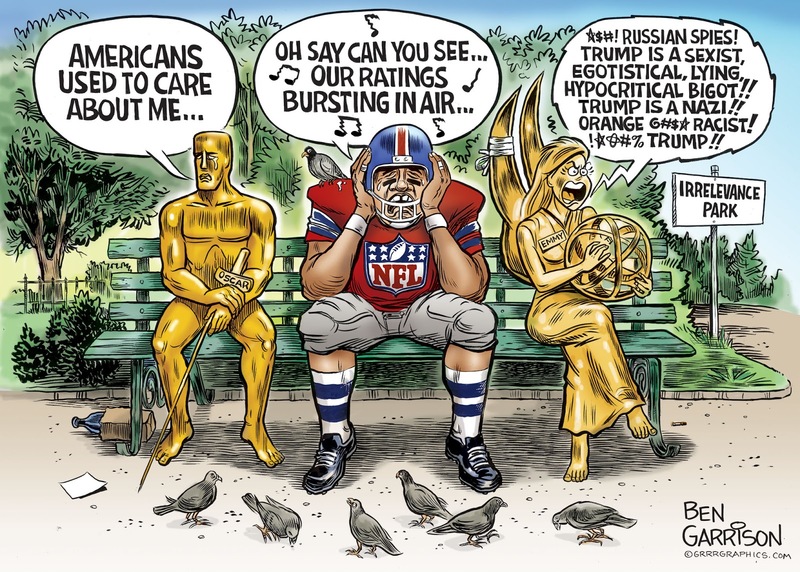 The latest Emmy award show hit a new low when they devolved into a Trump hate fest. No matter what size screen, the lefty actors seem to think we’re fascinated by their Trump bashing. It has become both tiresome and predictable. We’ve been seeing Silicon Valley and social media companies try to excoriate conservative voices from the Internet. The big money media and entertainment arms are starting to lose revenue, subscribers and viewers. They’ve long been accustomed to controlling the levers of our culture, but now they’re pushing those levers even more vigorously and blatantly toward collectivism. Americans can boycott and stop participating. Let’s try reading more books instead.